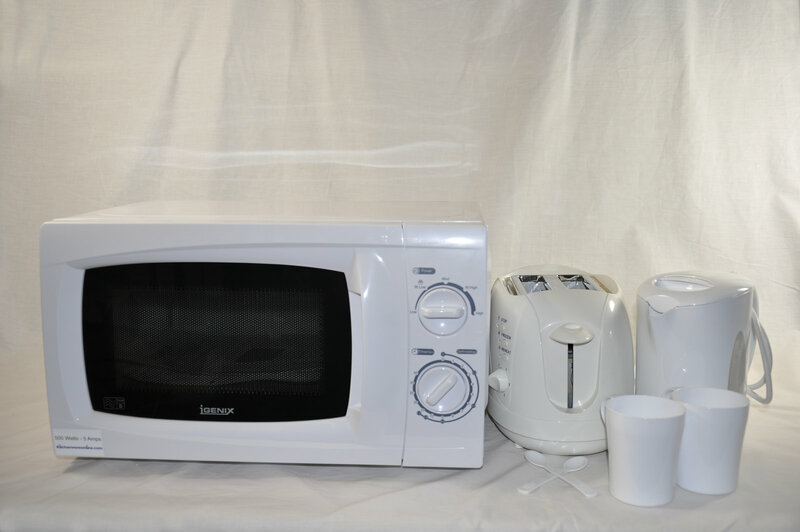 Low power microwave oven, kettle and toaster suitable for use on campsites, ideal for Caravans and Camper vans. Buying these as a bundle represents a saving of over 10% off the cost of the individual items. These ovens are specially converted in our workshop to reduce the cooking power to 500 watts. This enables them to run from a 6 amp supply without tripping the electric hookup. Compact construction with a white enamel finish casing and a white enamel interior. Supplied complete and ready to use with glass tray, roller ring and instructions. Needs a 240 volts AC, 5 amp supply, will plug directly into the 240 volt supply using the fitted 3-pin plug (supplied fitted). Low power (1000 watts) cordless electric jug kettle. Requires 240 volts mains electricity supply. 0.5 litre (about 0.8 pints) capacity with an auto switch off. This kettle can be used in Europe with a suitable adapter plug. Low power (700 watts) electric two slice toaster. Requires only 3.1 amps of 220 / 240 volts mains electricity supply. Can also be used for defrosting frozen bread and re-heating toast. 7 minute timer and "cancel" button. Toast slot width 25 mm. Toast slot length 130 mm. Supplied with a fitted moulded UK 3 pin mains plug. Can be used throughout Europe with a suitable adapter plug. Pleased to find a company providing equipment for those of us who love the freedoms that camping provides but don't particularly like to go all the way back to campfires or cooking with bottled gas. Each to their own way of finding enjoyment.